Edible forms of cannabis, including food products, lozenges, and capsules, can produce effective, long-lasting, and safe effects. These forms of cannabis are also the most likely to produce unwanted effects and overdose symptoms, which can be very unpleasant. The difference is, of course, the dose. Here, you’ll find a chart that describes typical effects felt at different ingested doses. However, there are factors to consider when choosing the right dose for you, which you can read more about below. Every person has a unique internal physiologic environment and can therefore experience different results with various medications. 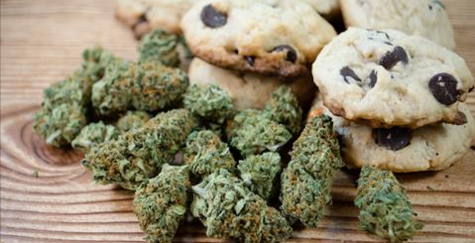 One person’s response to a dose of edible cannabis can vary significantly from the next, even more so than other medications or herbs. Why? Several factors are involved, including previous history of cannabis use, gastrointestinal factors, and the function/sensitivity of one’s endocannabinoid system. Approximately 3% of my patients area ultra-sensitive to THC and do well with very low doses (e.g. 1mg). Adding CBD to THC can enhance the medical benefits, such as pain or anxiety relief, while decreasing the adverse effects, such as impairment and elevated heart rate. CBD partially blocks the intoxicating effects of THC, so consumers who wish to experience the medical benefits of cannabis without as much impairment can best achieve this with products that contain both CBD and THC. It’s important for consumers to know the content of each of these components, and the ratio of CBD to THC. Products with a CBD:THC ratio of 1:1 are powerfully therapeutic and produce less impairment than a THC-dominant product. Excessive doses of these products can still produce classic cannabis overdose symptoms. As the CBD:THC ratio increases, the likelihood of unwanted intoxicating effects decreases, and the quality of the medical effects will also change. At a 4:1 ratio or higher, adverse intoxicating effects are unlikely unless one takes a very high dose. For example, a person who feels impaired after taking 5mg of THC will likely feel less or no impairment when taking 20mg of CBD + 5mg of THC. To avoid the potentially erratic absorption via the gut, I recommend starting with an edible that can be held in the mouth and absorbed primarily though the oral blood vessels under the tongue and in the cheeks. Tinctures, oils, lozenges, mints, troches, dissolving tablets, and gummies are all good options. Cookies, chocolates, and other food products can also be used if they are intentionally held in the mouth for 1-3 minutes before swallowing. Tinctures and oils are usually the easiest to use for precise dosing and gradually increasing the dose to find what works best for you. I encourage those new to cannabis edibles to wait two hours before taking an additional dose of cannabis. The most common mistake in cannabis dosing occurs when a person doesn’t feel any effect from an edible after one hour and decides to take another dose; two hours later, the individual experiences the unpleasant effects of an overdose. If you’re unsure if a particular dose of cannabis is affecting you, I recommend learning Healer’s “Inner Inventory,” a fast and simple self-awareness tool that can be used to determine if you’re feeling the effects of a particular dose of cannabis. For strategies to methodically increase your dose of cannabis to achieve optimal results, see Healer.com/programs. If you don’t feel any effects from an edible after one hour, try eating a snack like an organic apple to turn on the digestion and absorption in your gut. Some people who are new to cannabis require 2-3 doses before they feel anything at all, so it’s often best to try the same low dose three times with 8 to 24 hours between trials before increasing the dose. I’ve infrequently met patients who seem unable to absorb any significant amount of THC through the gut. In these individuals, absorption via the oral blood vessels or the lungs is the best option. A calm, safe environment and gentle reassurance that everything will be okay is the primary treatment. A large 50-200mg dose of CBD (without significant amounts of THC) can act as a partial antidote. Lemon oil, found predominantly in the rind and in lower amounts in the juice, has also been used historically for this purpose. Grate a tablespoon of lemon zest and chew it up before swallowing. Most people do not need emergency medical care unless they have pre-existing heart disease or other serious medical conditions. For ongoing vomiting and diarrhea, intravenous rehydration may be necessary.